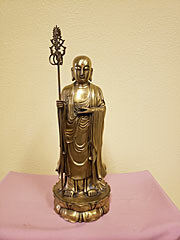 9.5 lbs 15.25" h x 6"w x 6"
the return of Maitreya Buddha. upholding the precepts and noble truths of the All-Guru and the boddhisatva ideal. placed in your hands are all the tools and implements required to stay true to your path. which we now know as the new Eightfold Path. With him, we prepare the way for the return of Maitreya and his retinue of saints.